PHOENIX — Rep. Ron DeSantis rode a robust endorsement from President Donald Trump to victory Tuesday in Florida’s Republican gubernatorial primary. DeSantis was one of several Republicans running in contests in Florida and Arizona who hoped that cozying up to the president would be rewarded by voters. The winner of the Florida governor’s race will give his or her party an advantage in a key political battleground heading into the 2020 presidential campaign. The Democratic primary featured a crowded and diverse crowd, and it was too early to call a winner as polls closed across the state. Florida Gov. Rick Scott is vacating the governor’s mansion to run for Senate. He easily won his primary, setting up a showdown with Democratic Sen. Bill Nelson that is expected to be one of the nation’s most competitive races. In Arizona, primary contests were shadowed by the death of Sen. John McCain. Though McCain was a towering figure who was elected to the Senate by Arizonans six times, the three Republican candidates running to replace his retiring seat-mate, Sen. Jeff Flake, aligned themselves more with the president than the longtime senator. Arizona Gov. Doug Ducey planned to name a replacement to fill McCain’s seat after the primary. 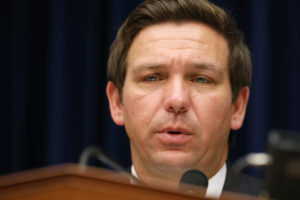 Trump surprised Florida Republicans late last year with his endorsement of DeSantis, and he has frequently tweeted about the lawmaker, one of his staunchest supporters in Washington. Trump’s backing helped push DeSantis past Agriculture Commissioner Adam Putnam, who has held elected office in Florida since 1996, quickly built up establishment support and raised millions of dollars.